I went shopping in my local supermarket, when I came out this note was on my windscreen. Classic pickup strategy. Lure her in with how much money you have. I used to work at a bank, and the grounds guy would find atm receipts on the ground sometimes, and if they had a large enough balance he would hold on to them to give girls his number on them. Has anyone noticed this person has over 10 grand in their account? If this was just some anonymous note, how’d she know his name? 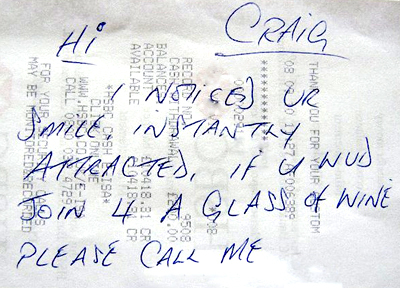 “Craig” wrote the note to “Donna”… derp. Who says it was actually the writer’s account?